One only needs to mention AZUR by Le Bernardin to receive glorious reports about what many food aficionados consider to the finest cuisine in Europe and the United States. The reason for this outstanding reputation is the consistent preparation and impeccable presentation of cuisine brought to this area by partners Maguy Le Coze, born in Brittany, France and renowned French Chef Eric Ripert, from the internationally acclaimed Le Bernardin in New York City. The elegant French seafood restaurant at La Quinta Resort & Club specializes in the freshest seafood, free-range chicken, duck, homemade ravioli and exceptional beef, paired with some extraordinary imported and domestic wines, including Dom Perignon by the glass. In the 120 seat restaurant, the a la carte menu, which offers nightly specials, is very appealing to guests, and the signature dishes include a sautéed halibut with chick pea puree and a refreshing citrus vinaigrette; and oven roasted Maine lobster, with creamy white truffle polenta and shallot Madeira sauce; and oven roasted rack and eighteen hours braised leg of lam with goat-cheese mashed potatoes and baby vegetables and red wine sauce; and a pan seared organic filet mignon with green peppercorn brandy sauce. Eric Ripert, executive chef and co-owner of Le Bernardin in New York, serves as consulting chef for AZUR by Le Bernardin and works closely with Eric Wadlund, Chef de Cuisine at the La Quinta Resort & Spa restaurant. Wadlund, the son of a Wisconsin baker, began his culinary career when at 4 years of age he whipped up his first batch of doughnuts. His formal training began when he was 18 at the acclaimed Madison Club in Wisconsin under Chef Jerry Zackerski. 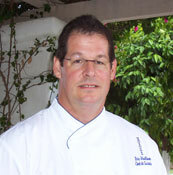 Chef Wadlund worked under the James Beard winning Chef Jeffery Buben at the Occidental Restaurant, located next to the White House in Washington. "It was there that I became passionate about food, " Wadlund said. His passion earned him the title of Sous Chef, and soon he found himself opening Loews Coronado Bay Resort as executive banquet chef, where he worked for Chef Jeff Tunks. He received national recognition while working for Café Terra Cotta in Tucson, and the popular venue was selected as one of the top 10 Bistro's in the United States by the American Academy of Restaurants and Hospitality Sciences. He returned to California, and was Executive Chef of the 4 Star- 4 Diamond La Casa Del Zorro in San Diego; opened the Rattlesnake in Palm Springs with Jimmy Schmidt, which won best new restaurants and the American Academy of Restaurants Hospitality Sciences 4 Star Diamond Award. Chef Wadlund has appeared on numerous TV shows, and has a litany of culinary awards and honors to his credit. Now, as the Chef de Cuisine at AZUR by Le Bernardin at La Quinta Resort & Spa, he is committed to creating and preparing the freshest, finest cuisine available in the famous California resort area, and I can attest to the fact that he is honoring his commitment to excellence quite nicely. There are audible sighs of delight from guests in the elegant AZUR during dinner. The presentation is exquisite, and the preparation is magnifique! I was sitting next to a French speaking couple at dinner, and they were gobbling up every bite and bit of sauce on their plates with a "last supper" passion. To try to break down the individual recipes for comparison would be a mute point. This is one of possibly three dinners in my life that left me breathless. Every dish seemed to add to a crescendo of opulent excellence in fine cuisine, with the added pleasure of impeccable service and special attention from Karel Vidlak, restaurant manager. I visited the huge restaurant kitchen, following my dinner, to watch the plates being prepared to go out to hungry diners. I was surprised to see one cart with shelves that held spices, rice and pasta, and according to the chef everything else used in the AZUR kitchen is totally fresh. La Quinta Resort & Club opened in 1926, and has long been a place for Hollywood's brightest stars to relax and play. Frank Capra is believed to have written "It Happened One Night" at what he described as his lucky casita, and Irving Berlin is said to have written "White Christmas" while staying at the hotel. Oprah Winfrey, Matthew Perry, Adam Sandler, Queen Latifah and Christina Aguillera have been recent guests at the resort. The 800 guest rooms and suites are exquisite, and overlook little private pools, and can be transformed into three-bedroom suites for family reunions. Rooms and suites vary in price from $225 to $3,500. The outstanding golf courses, which include PGA WEST, Pete Dye-designed La Quinta Resort Mountain and Dunes courses, TPC Stadium Gold Course, Jack Nicklaus Tournament Course at PGA WEST and the greg provide a challenge for golfers of every level, along with extremely beautiful views, and wonderful clubhouse amenities. The Mountain course is said to be a favorite place of lady golfers, and I was told that Queen Latifah had recently taken a lesson and played a round. The nearby world-class La Quinta Spa is a house of harmony experience, where every pampering imaginable is offered. According to spa therapist Nancy Garcia, the 23,000 square-foot State-of-the-art Spa La Quinta is dedicated to the concept of "wellness," spa programming Spa La Quinta combines today's knowledge with ancient treatments of indigenous Mexican and Native American cultures. Additional dining venues include The Adobe Grill, filled with color and Mariachi music, where signature dishes include Caldo de Mariscos, a delicious southwestern bouillabaisse, and guacamole made at your table. A perfect breakfast place for eggs Benedict and hash is Morgan's restaurant, where an open kitchen puts the chefs on display creating a variety of American dishes. There is also a pleasant outdoor Spa Bistro that overlooks the tennis courts, and the Mountain Dunes golf Clubhouse features breakfast and lunch with picturesque views of the course. During Easter weekend the grounds of the resort are transformed into a charming children's wonderland of hunting for eggs and a beautiful brunch decorated with pastel ribbons, complete with an Easter Bunny to include in family photos. Although this is the ultimate kiddie casita, and the resort provides special services to families, at no time is the privacy of single guests or couples is never compromised in any way. This is truly a haven for relaxation that offers spectacular and unique amenities for people with a taste for the best in food, sports, pampering and leisure. The resort is located at 49-499 Eisenhower Drive, La Quinta, California. For reservations call 1-888-564-1007 or visit www.laquintaresort.com.